They're releasing the raid content in small installations which is interesting. Good to get some solid answers about other things too. Two versions of the game in database - live and development. * * The development data was created over the live version. Eventually they changed it so that the team could work on multiple patches at a time. The team was able to use reference data to find models in Classic that were not correct, such as colors of lanterns. Purple was used as a color to recognize wrong model colors. Things like pet happiness and training was not able to be restored with this method. They had the data to restore them, however, and managed to re-code them back into the game. Rogue combo points being on the target, weapon skills, and critical blows all had to be re-coded back to how they were in vanilla. I'm just a little worried about the difficulty with 16 debuff slots, progressive itemization? and patch release itself. Kazzak and Azu and DM on release, Green dragons at AQ release? 16 debuff slots is a good thing--sure it was a technical limitation back in the day... but it'd be a joke without it to progress through the raid content. Regarding the itemization--they didn't really mention it. Only that high-end PvP rewards will come out with BWL as they're just as strong or even better according to them. That means no ranking at launch? Dire Maul, Kazzak and Azuregos should be released in another stage and not with Molten Core and Onyxia. It's clear that it seems to be the preferable way of doing it. I guess... no battlegrounds either? Right. You're correct. 8 debuffs is what's up during Mölten Cöre and Onyxia. I genuinely hope they don't screw it up with adding it up to 16 during that time. We don't know yet. They haven't mentioned it. Only what you mentioned regarding the PvP rewards. Love this attention to the small details! What’s the big deal about this though? Why is loot trading so bad? At first glance people may not see it. The actual solution for this is personal loot, not loot trading. What do you mean by personal loot? [*]Achievements are not in Classic. Awww... I would have loved to have achievements in classic. But you do have achievements there. Every little gear upgrade, talent point, quest or special class quest or dungeon completed and much more. All of these little milestones along the way feel like you have achieved something worthy. Simply because you have to earn it. Under personal loot the game chooses a number of players (based on group size) and awards them a random item for their spec, while everyone else receives an amount of gold specific to them. Mounts can also be won via this method from bosses that drop them. Like solo looting, the drops are retrieved by directly looting the corpse of the boss, with the chat logs showing who's won something. Loot from Personal Loot is tradeable to anyone for whom the item is an ilvl upgrade, as long as it is also not an ilvl upgrade for yourself. Without a doubt I agree with you, guys, it is a way to see the achievements, nothing more rewarding than having a title, an exalted reputation, or having the thunderfury equipped; but personally I had already adapted and I liked having them all described, organized and segmented in one section. In addition, the way in which the system of achievements currently works has become a style of play for those players whose goal in the game is to have all possible points, why lose this type of players being a relatively simple addition to the game? I do not know if it's just me but I know a lot of people who are addicted to achievements. The so-called pokemon masters, catch them all. I already see myself next year unconsciously pressing the keyboard shortcut (Y) several times. I hadn’t realized that Dire Maul would be available at launch. I think we’ll see a much quicker market rise than if it wasn’t available at launch. Yeah I feel you on this - perhaps the classic armory, or a 3rd party site like this will implement a faux-achievements style thing which categorises these ‘achievements’ in a form similar to retail? Personally its enough for me to see that Reputations window greened up! I dont understand the logic behind defending retail achievment system. I'm fine with achievements being not in the game, but to respond to Faendor, I think they could be implemented without harming classic in anyway provided they didn't provide any ingame reward other than perhaps titles. Giving people their own client side minigame to play doesn't hurt the vanilla experience, though I suppose some people might get lost chasing achievements and thereby not participate socially or in guild matters, but I think those people would be a exceedingly small minority to the point it's not worth being concerned about it. I'll never understand people who hate anything being added to classic that would be optional to participate in and wouldn't effect the gameplay or social dynamics of the game. Achievements, toggle-able updated graphics, and transmog (that could be toggled off by viewers) are good examples of things that could enhance some people's classic experience while having no impact on the purist's experience. I'm more on the purist side of things, but I also want classic to be as popular and as appealing as possible while remaining the same game and social dynamic. Other people viewing updated models or getting updated about an achievement doesn't bother me if I can turn it off. Whats your logic in attacking these things ? (I dont mean that retail people shouldn't be encouraged to play Classic, quite the opposite rly, but at the same time you should not confuse those two titles). Once you allow Blizzard / Activision to add whatever they want, it will become a slippery slope to other deviations. Achievements are just a filler that brings nothing to the quality of gameplay. Even if you could personally turn it off, it would still be in there. I don't know man but I feel like I hate any Blizzard addition because of their aproach and philosophy behind it. Blizzard is NOT the company it used to be when they shipped original wow and people should realize that by now. I'm not Faendor, but I can put my own view, which will probably not be any more agreeable. One part is of course the preservation of the old days. A museum. Something that shows you "this is how the game was." 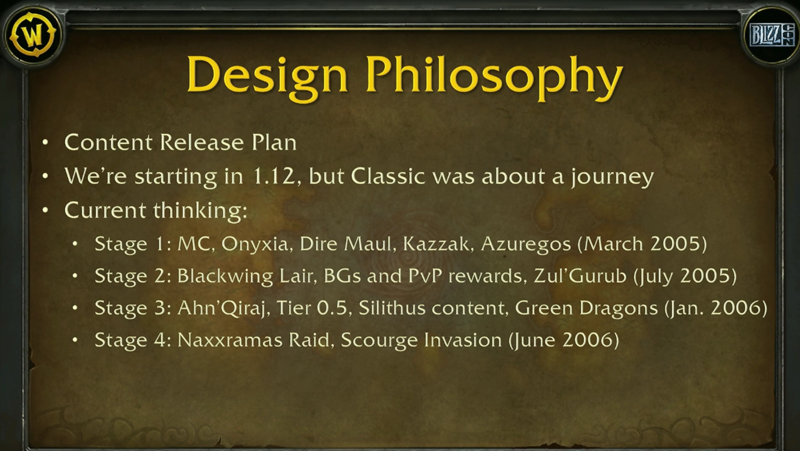 Which of course brings the argument that if it didn't exist in Vanilla, it shouldn't be in Classic. Which more or less brings me to my own view of the spirit of Vanilla. Just because you wanted something, it didn't mean you could have it. You were given the tools in this world, and that is what you had to work with. You didn't always have options upon options to turn on other options that were only visible for you. It's more or less the idea of the game not adjusting itself to you, but you had to adjust yourself to the game. You did your best to survive the world and you didn't need options to look prettier, and neither did you need a list telling you what achievements were, you made your own achievements. Whether the game will be released in 2019 or not does not matter, just because other games, or that current World of Warcraft has options, it does not mean Classic should have these options. If people can not stand it, or handle it, then perhaps the current game is where they should stay where all these options exist, and those who are up to tackle a world like Classic, can go for it, where the game is not catering to them.